More than just the cloud’s portal, vCloud Automation Center is a top-of-stack technology that delivers self-service, application lifecycle, governance, and policy-driven controls across hybrid clouds and heterogeneous infrastructures (virtual + physical!). It is how consumers interface with your cloud. In addition to native integration with vSphere, Hyper-V, XEN, and Amazon EC2 environments, vCAC 5.1 added native integration with vCenter Orchestrator and vCloud Director…and MUCH more to come this year. Integration with vCenter Orchestrator means that any vCO workflow can be called from vCAC’s own orchestration engine in a pre-, active-, and post-provisioning task, which opens up a tremendous amount of possibilities. Go ahead, think about that a bit. 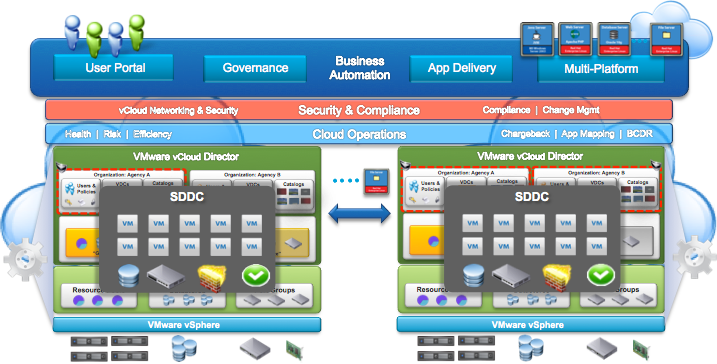 As key components of the vCloud Enterprise Suite, vCAC drives business automation, while vCloud Director (vCD) delivers multi-tenancy, dynamic networking, and the cloud abstraction layer, and vCO focuses on IT orchestration and integration. It didn’t take too long to fall in love with vCAC. Not only has it filled a major gap for VMware’s holistic cloud vision, but it delivers that with time-to-value in mind. It delivers its capabilities with as little effort as I’ve seen with any competing cloud technology out there. This is the difference between spending weeks and weeks (months?) in a services-lead engagement trying to deploy a subpar solution, beating on the walls, and ripping your hair out thanks to a supposedly “straight-forward” install (you know, it’s where you hear “wow, i’ve never seen that before…this usually is very straight forward!“) vs. an on-premise implementation of a technology that may take 1 or 2 days to install and perhaps a few more to build out the out-of-the-box capabilities. And when I say out of the box, i mean OOTB — I mean native workflows and point-and-click processes to deploy 90%+ of all your cloud use cases in a slick, intuitive interface. For the other 10%, there’s the Design Center and Cloud Development Kit, which will let your imagination run wild. These are for the not-so-OOTB use cases and will allow you to harness the real power of vCAC. Use this guide to install vCAC in your own environment, understand the steps and concepts, or troubleshoot an existing install. I will follow up in another post with some of the gotchas that folks tend to miss — usually prerequisites, DB connectivity, etc. DISCLAIMER: This guide is intended for use in a test/dev or sandbox environment and NOT for a production build and comes with no guarantees, support, etc. WriteIIS7ConfigChanges: Error 0x80070002: Failed to configure IIS application. WriteIIS7ConfigChanges: Error 0x80070002: WriteIIS7ConfigChanges Failed. I think this should be fixed in the installer, or else documented in the install guide as a prereq to only use the Default Web Site.